Truffle deviled eggs are super easy to make. If you enjoy classic deviled eggs you may be looking for a new way to prepare this favorite, I have got a super easy recipe for you. Can’t enough of low carb snacks? Deviled eggs are the perfect solution for low carb snacks! One item seems to fly off serving platters at a potluck and that is deviled eggs. 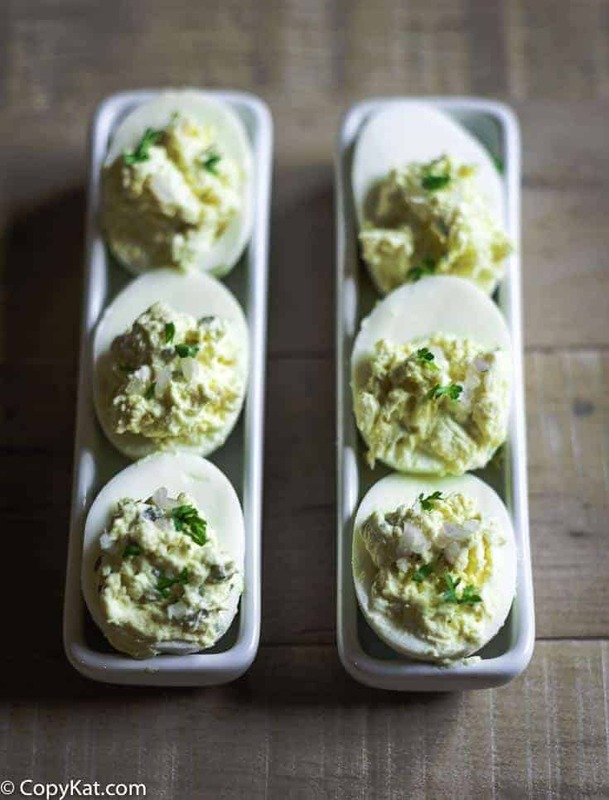 Have you ever been to a party, or a potluck dinner and found there were leftover deviled eggs? I never have. Deviled eggs are so simple to make. Deviled eggs are small vehicles for adding a unique flavor. 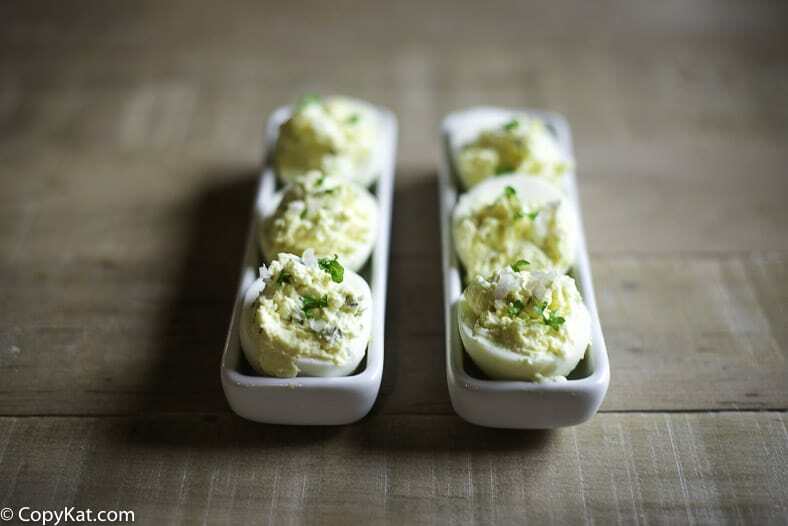 Deviled eggs come in all sorts of flavors; salt, savory, and even spicy. I have a blog post where you can find 99 different recipes for deviled eggs. You do not need expensive truffles to enhance deviled eggs. You can use truffle oil and if desired truffle salt. The creaminess of the egg yolks really helps to carry the flavor of the truffle. A tiny pinch of truffle salt can do wonders for the eggs. 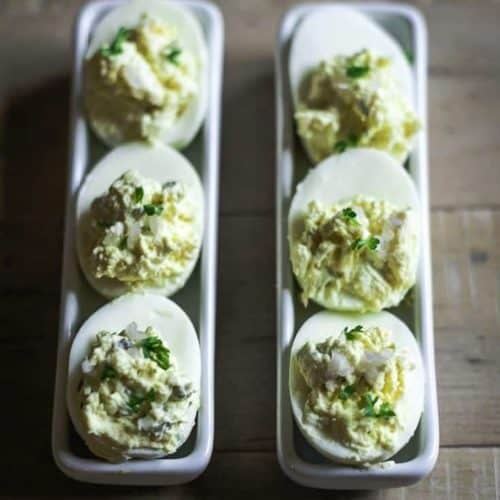 These two layers of truffle with mayonnaise, pickles, a touch of onion, make these ordinary deviled eggs something extraordinary. You may want to add some fresh herbs like chives, parsley, or even fresh chervil. They will add a nice brightness to the flavor. You could also use capers for a little punch of salt. Buy your eggs about 1 week before you will make them. Fresher eggs are harder to peel. Enjoy this great variation on your classic deviled eggs with this easy recipe! You can make some delicious truffle deviled eggs, by adding one simple ingredient to transforms ordinary deviled eggs into something more exotic. Hard boil eggs your preferred way. Peel eggs and slice the eggs in half. Cut the eggs in half down their length, from tip to bottom. Remove the yolks. Gently squeeze the yellow yolk out of the egg. Place the yolks into a medium-sized bowl. Place the eggs on a plate, cut side up. Make the filling. In the bowl with the egg yolks add 3/4 cup mayonnaise, 1 tablespoon minced red onion, 2 teaspoons mustard, 1 teaspoon truffle oil, 1/4 teaspoon salt, and the minced dill pickle. Stir to combine. Mash the egg yolks as you stir. Stir until the egg mixture is creamy. Fill the egg whites. Fill the eggs by spooning the egg yolk mixture into the egg whites. You can fill a piping bag, and pipe the filling into the egg whites. Garnish - if desired. You can garnish with fresh herbs or a sprinkling of paprika if desired. Hard boiled eggs can be prepared in advance by a couple of days. This will make the eggs very easy to peel. Hard boiled can be stored for a couple of days in your refrigerator. You can swap out the red onion for minced shallots if desired. For easy to peel eggs, check out the Internet’s IP recipes – you will not be disappointed! I’ve always made deviled eggs this way (without the tuffle part) I just recently purchased my first jar of truffle salt, so I’m super excited to try it on this recipe! Also, try cracking your eggs into a cup cake tin and baking at 350 until set. Waaay easier than peeling! Wendy, I am going to try making eggs your way! Thanks for the tip. I love truffle salt. I like it most on grilled steaks and in mashed potatoes. Can’t wait to try this recipe!! Deviled eggs are one of everyone’s favorites around my house! Making these for my cocktail party.